While the holidays are a great opportunity to spend time with family, and indulge in some yummy eats, it is also a great opportunity to serve others who do not have these luxuries. The holidays can be a very lonely, and difficult time for many, but there are things we can do to bring that holiday cheer into their lives. 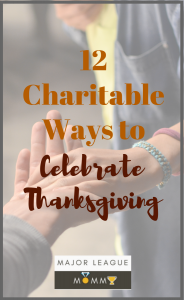 As a matter of fact, you can serve others while getting in that quality family time using one of these 12 Charitable Ways to Celebrate Thanksgiving. I’m sure you’re familiar with the concept of adopting a family for Christmas, but why not adopt a family for Thanksgiving as well? This could be a neighbor who is going through a tough time, a military family, or whoever you feel could really use a nice home-cooked meal. Visit a local hospital, and distribute cards and/or stuffed animals that’ll brighten the patients’ day. You can even sit and talk for a minute. Sometimes people just want someone to talk to. Make a nice warm meal for your local police or fire department. This is a great way to thank them for their service to the community. Go through your closets and drawers to find clothes (or shoes) that you no longer wear. You can donate these items to a local church or organizations such as the Salvation Army. Create a care pack filled with items such as: water bottles, non-perishable snacks, socks, gloves, lip balm, hand wipes, feminine hygiene products, dental hygiene travel set, comb and brush, Kleenex, lotion, blanket, etc. Hand these care packs out to individuals you see living on the streets, or even in homeless shelters. Make thank you cards as a family to send to our military. This is a good way to send some holiday cheer our soldiers’ way. Our animal friends need some love too! Spend some of your Thanksgiving charity efforts helping our beloved animal family at an animal shelter. Bring some Thanksgiving fun to an assisted living facility by hosting a bingo night for residents. You can even bring some special treats for them to enjoy while they play. Gather some food to donate to your local food bank. Help fill a few bellies this Thanksgiving. Serve a nice warm dinner at a soup kitchen. This is a fun and easy way to spread a smile this Thanksgiving. Hand out some of these cards while you are out and about and watch the recipients’ face light up. 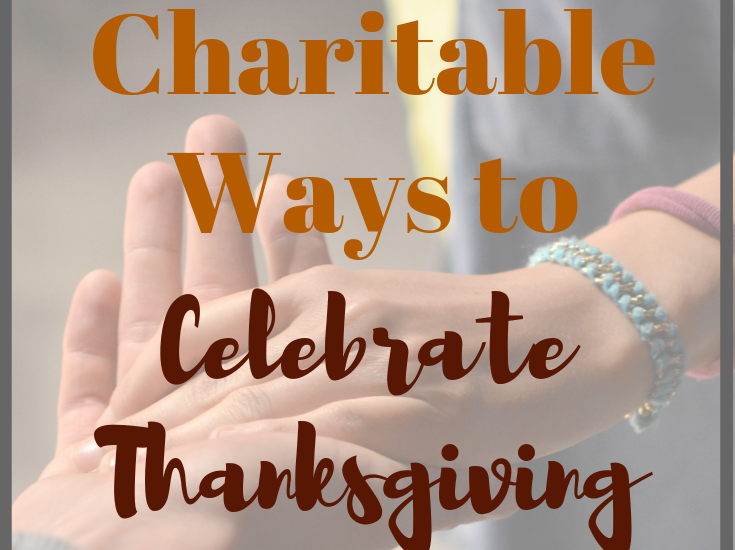 There are lots of fun ways to celebrate Thanksgiving through service to others. If you enjoyed this post, please feel free to join the conversation on our Facebook. We would love for you to share some of your ideas on charitable ways to celebrate Thanksgiving.